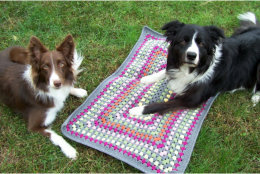 The thought crossed my mind to keep going and turn it into an Afghan, but since I have two afghans that are still not finished, adding a third doesn’t seem like the best idea right now. I really like this – has massive potential! 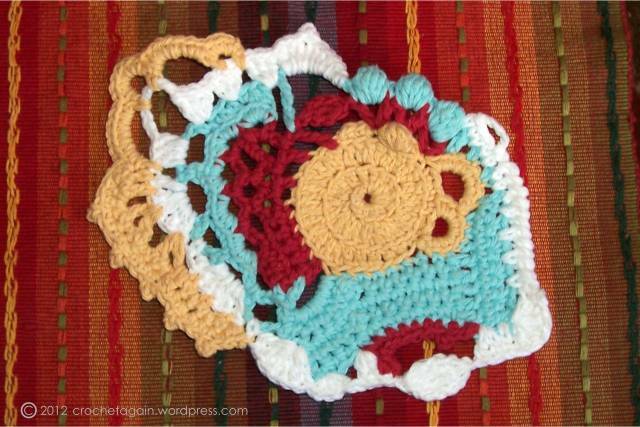 I’m a crocheter & visual artist, & I can see something of abstract painting in this particular example you’ve made. If you make more of these (& I hope you will!) I’d love to see them up here. When I started, I had no plan for it to become anything, other than a freeform sample. But since I used cotton yarn in the colors for my kitchen, it will sit on my counter and be used to put hot dishes on and be seen. Maybe that is a new artform, counter art : ) I have seen some beautiful freeform doilies, that is another thing to make without a huge time/materials investment. I’m such a symmetrical thinker – I don’t know if I could do this! I think it looks very cool and I love that you just went for it. I think it might be a good exerciser for me to try. Just to push me outside of my comfort zone. Who knows? I might find that I love it just like you did! Oh do try it! No rules was very fun! I just keep thinking… what would happen if I do this, and then I did it to see. I did pull things out because it wasn’t going to lay flat and had to redo. Use some leftover yarn you have hanging around. I used all the same, but many freeforms use different ones to have a variety of textures. You would have to consider how different yarns would wash up, if you planned on being able to wash the item. Wouldn’t want one area to shrink more than others, or felt, or not be able to be washed at all. I love this! I have been itching to do some freeform crochet, and I even started something, but I have too many projects in progress right now–I am trying to finish a few things up. I always have a lot going, and I really can’t imagine having less than 10 or so projects in progress at any given time, but I have more than that now, and not many close to completion, so I need to finish a few things before I start more. There are just so many things to be made!